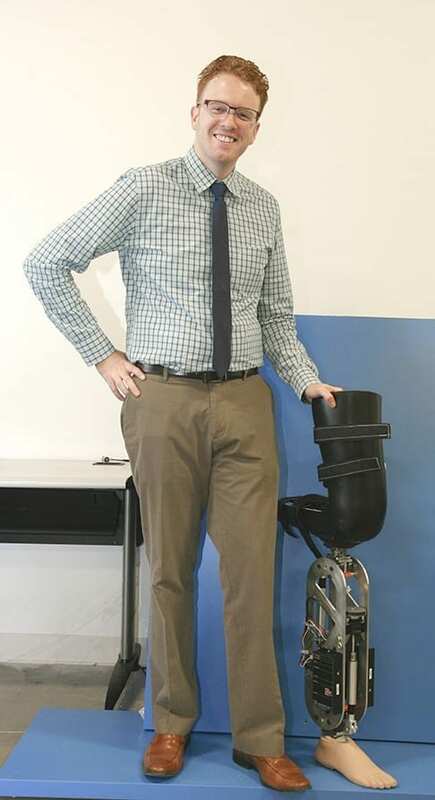 Dr. Robert Gregg stands next to a robotic leg that was designed by UTDesign students and is similar to the one reported in his research. A University of Texas at Dallas professor applied robot control theory to enable powered prosthetics to dynamically respond to the wearer’s environment and help amputees walk. In research available online and in an upcoming print issue of IEEE Transactions on Robotics, wearers of the robotic leg could walk on a moving treadmill almost as fast as an able-bodied person. Humanoid robots can walk, run, jump and climb stairs autonomously, but modern prosthetics limit similar actions in humans. While prosthetics have been made lighter and more flexible, they fail to mimic the power generated from human muscles in able-bodied individuals. Powered prostheses, or robotic legs, have motors to generate force, but lack the intelligence to stably respond to disturbances or changing terrain. Control engineers view the human gait cycle through the lens of time — the interval at which each movement in the walking cycle needs to occur. Gregg, an assistant professor of bioengineering and mechanical engineering, proposed a new way to view and study the process of human walking: measuring a single variable that represents the motion of the body. In this study, that variable was the center of pressure on the foot, which moves from heel to toe through the gait cycle. Gregg first tested his theory on computer models, and then with three above-knee amputee participants at the Rehabilitation Institute of Chicago, an affiliate of Northwestern University. He implemented his algorithms with sensors measuring the center of pressure on a powered prosthesis. Inputted with only the user’s height, weight and dimension of the residual thigh into his algorithm, the prosthesis was configured for each subject in about 15 minutes. Subjects then walked on the ground and on a treadmill moving at increasing speeds. “We did not tell the prosthesis that the treadmill speed was increasing. The prosthesis responded naturally just as the biological leg would do,” Gregg said. The participants were able to move at speeds of more than 1 meter per second; the typical walking speed of fully able-bodied people is about 1.3 meters per second, Gregg said. The participants also reported exerting less energy than with their traditional prostheses. April 18, 2019 - Police: Louisiana woman beat her boyfriend with prosthetic leg WDIV ClickOnDetroitA New Orleans woman was arrested last Wednesday on suspicion of beating up her boyfriend with his own prosthetic leg after he tried to break up with her. April 16, 2019 - Woman arrested for beating boyfriend with his own prosthetic leg TheGrioMichelle Jackson didn't take it well when her lover told her that he wanted to see someone else. In fact, she went out on a limb. April 12, 2019 - SC girl dances with prosthetic leg, goes viral KWCHHer mother posted an online video of the 10-year-old dancing and doing flips -- all with a prosthetic leg. April 17, 2019 - Michelle Jackson Allegedly Beat Ex With His Prosthetic Leg | Crime Time Oxygen“It's not every day you find someone who's been beaten by one of their own limbs,” said Jason Rivarde, spokesman for the Jefferson Parish Sheriff's Office. March 25, 2019 - LIMB-art to launch new prosthetic leg cover designs Medical Plastics NewsLIMB-art, a British design and manufacturing company announces plans to present new prosthetic leg cover designs at trade show, Naidex.